There was a recent account in the news about the story of three fishermen who survived 9 months adrift at sea in a 29 foot boat. (NYTimes 8/26/06 A3). Although the emphasis of the report was on their survival activities, a review of the events leading to this accident can be helpful in preventing accidents at home. Background–The boat and crew were on a shark-fishing trip, which typically lasts from 3 days to a week. There was concern at the outset that enough provisions (food, water, fuel) had been laid in for the trip. At sea, the crew lost their shark-fishing tackle. During the search for the equipment, they ran out of fuel. Winds pushed them out to sea where a current caught them and carried the boat 5000 miles west from Mexico to the Marshall Islands. There, the survivors were rescued by a fishing boat. It was a series of breakdowns or coincidences that finally enabled the accident to occur. In this case, there were insufficient resources, a boat without a radio, poor judgment during the search, and an unfavorable wind and current direction. Many accidents follow this pattern of several breakdowns. These breakdowns represent holes in the defense against an accident. The pattern is often recognized after the fact. However, a straightforward method of analysis exists that helps to identify the potential areas of risk for an accident before the event occurs. The model developed by Reason (1990) is based on the assumption that there are several different elements that must all be considered in order have a safe event. Although there is always emphasis on the failure event itself, there are preconditions that have allowed this event to occur. The trick is to analyze these preconditions in advance. The categories are the unsafe act or accident itself, the conditions that enabled the accident event, the supervision, and the influence or attitude of those in charge. The diagram above illustrates the “Swiss Cheese” name. Each of the levels of defense can have holes in them. Since there are several layers of protection, a failure in any one level does not lead to an accident. However, if all of the breakdowns in defense happen to line up, as with the holes in the diagram above, an accident can occur. There are many web sites to get specific TIPS of preventive actions to take to reduce the risks of accidents in each category. Obviously, they should be used. Beyond that, everyone’s situation is a little different; some risks are more specific to your own situation. 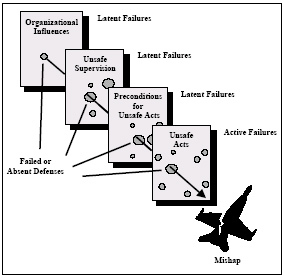 Reason’s “Swiss Cheese Model” can be used to analyze and address these specific hazards before they become accidents.As an example, take the category of falls. The statistics show that consequences from falls are a serious problem for all ages, especially very young children and older adults. Eliminating the preconditions of the accident is the first level of defense. Some of these preconditions, such as the material stored on the edge of the stairs, can be addressed by better supervision. This increased supervision adds another layer of defense. Others, such as the dim light or the handrail can be corrected by the owners. Some, such as the steepness of the stairs, must be accepted. However, changes in the attitude of the owners to make improvements also adds a layer of defense. Actions at each of these different defense levels, reduce the overall risk of an injury due to a fall. In every home, look for specific areas that cause the people more concern for safety. People who live there know them. In addition to following good general preventive measures, available on the web, this method allows focus on those topics in a systematic way in order to reduce the risk as much as possible. However, just doing the exercise, increases the awareness for the risks of accidents in other areas throughout the house. That is another significant benefit. This entry was posted on Tuesday, September 12th, 2006 at 8:38 pm and is filed under Five Favorites, Health and Safety. You can follow any responses to this entry through the RSS 2.0 feed. You can leave a response, or trackback from your own site. nice work & good job.